Recently in my posts I’ve been using finite differences to approximate the gradient of loss functions and dynamical systems, with the intention of creating generalizable controllers that can be run on any system without having to calculate out derivatives beforehand. Finite differences is pretty much the most straight-forward way of approximating a gradient that there is: vary each parameter up and down (assuming we’re doing central differencing), one at a time, run it through your function and estimate the parameters effect on the system by calculating the difference between resulting function output. To do this requires 2 samples of the function for each parameter. But there’s always more than one way to peel an avocado, and another approach that’s been used with much success is the Simultaneous Perturbation Stochastic Approximation (SPSA) algorithm, which was developed by Dr. James Spall (link to overview paper). SPSA is a method of gradient approximation, like finite differences, but, critically, the difference is that it varies all of the parameters at once, rather than one at a time. As a result, you can get an approximation of the gradient with far fewer samples from the system, and also when you don’t have explicit control over your samples (i.e. the ability to vary each parameter one at a time). where is a perturbation to the parameter set, and the subscript on the left-hand side denotes the derivative of with respect to . which works as long as is square. When it’s not square (i.e. we have don’t have the same number of samples as we have parameters), we run into problems, because we can’t calculate directly. To address this, let’s take a step back and then work forward again to get a more general form that works for non-square too. Alright! Now we’re comfortable with this characterization of gradient approximation using a form that works with non-square perturbation matrices. Again, in FDSA, we only vary one parameter at a time. This means that there will only ever be one non-zero entry per row of . By contrast, in SPSA, we vary multiple parameters, and so rows of will be just chalk full of non-zero entries. This paper, by Drs. Jan Peters and Stepfan Schaal, is where I first stumbled across the above formulation of gradient approximation and read about SPSA (side note: I really recommend reading instead the Scholarpedia article on policy gradients, because it has fixes to a couple notation mistakes from the paper). Reading about this I thought, oh interesting, an alternative to FDSA for gradient approximation, let’s see how it well it does replacing FDSA in a linear quadratic regulator (LQR). based on (Peters & Schaal, 2008). # with probability of .5 for each +-1 outcome. A couple notes about the above code. First, you’ll notice that the f_x and f_b matrices are both calculated at the same time. That’s pretty slick! And that calculation for f_xu is just a straight implementation of the matrix form of gradient approximation, where I’ve arranged things so that f_x is in the top part and f_u is in the lower part. The second thing is that the perturbation vector delta_k is generated from a Bernoulli distribution. The reason behind this is that we want to have a bunch of different samples that pretty reasonably spread the state space and move all the parameters independently. Making each perturbation some distance times -1 or 1 is an easy way to achieve this. Thirdly, there’s the num_iters variable. This is a very important variable, as it dictates how many random samples of our system we take before we estimate the gradient. I’ve found that to get this to work for both the 2-link arm and the more complex 3-link arm, it needs to be at least 20. Or else things explode and die horribly. Just…horribly. The first thing to notice is that I’ve finally discovered the Seaborn plotting package. The second is that SPSA does as well as FDSA. You may ask: Is there any difference? Well, if we time these functions, on my lil’ laptop, for the 2-link arm it takes SPSA approximately 2.0ms, but it takes FDSA only 0.8ms. So for the same performance the SPSA is taking almost 3 times as long to run. Why? This boils down to how many times the system dynamics need to be sampled by each algorithm to get a good approximation of the gradient. For a 2-link arm, FDSA has 6 parameters ( and ) that it needs to sample twice (we’re doing central differencing), for a total of 12 samples. And as I mentioned above, the SPSA algorithm needs 20 samples to be stable. For the 3-link arm, SPSA took about 3.1ms on average and FDSA (which must now perform 18 samples of the dynamics) still only 2.1ms. So number of samples isn’t the only cause of time difference between these two algorithms. SPSA needs to perform that a few more matrix operations, including a matrix inverse, which is expensive, while FDSA can calculate the gradient of each parameter individually, which is much less expensive. OK so SPSA not really impressive here. BUT! As I discovered, there are other means of employing SPSA. In the previous set up we were using SPSA to estimate the gradient of the system under control, and then we used that gradient to calculate a control signal that minimized the loss function (as specified inside the LQR). This is one way to use gradient approximation methods. Another way to use these methods is approximate the gradient of the loss function directly, and use that information to iteratively calculate a control signal that minimizes the loss function. This second application is the primary use of the SPSA algorithm, and is what’s described by Dr. Spall in his overview paper. # probability of .5 for each +-1 outcome. The main as-of-yet-unexplained parts of this code are the alpha, gamma, a, A, and c variables. What’s their deal? Looking inside the loop, we can see that ck controls the magnitude of our perturbations. Looking a little further down, ak is just the learning rate. And all of those other parameters are just involved in shaping the trajectories that ak and ck follow through iterations, which is a path towards zero. So the first steps and perturbations are the biggest, and each successively becomes smaller as the iteration count increases. There are a few heuristics that Dr. Spall goes over, but there aren’t any hard and fast rules for setting a, A, and c. Here, I just used HyperOpt to find some values that worked pretty well for this particular problem. You’ll notice that in both the SPSA and FDSA code we’re no longer sampling plant_dynamics, we’re instead sampling cost, a loss function I defined. From just my experience playing around with these algorithms a bit, getting the loss function to be appropriate and give the desired behaviour is definitely a bit of an art. It feels like much more of an art than in other controllers I’ve coded, but that could just be me. So that’s all the code, let’s look at the results! For these results, I used a max of 10 iterations for optimizing the control signal. I was definitely surprised by the quality of the results, especially for the 3-link arm, compared to the results generated by a standard LQR controller. Although I need to note, again, that it was a fair bit of me playing around with the exact cost function to get these results. Lots of empirical analysis. The two controllers generate results that are identical to visual inspection. However, especially in the 3-link arm, the time required to run the FDSA was significantly longer than the SPSA controller. It took approximately 140ms for the SPSA controller to run a single loop, but took FDSA on average 700ms for a single loop of calculating the control signal. Almost 5 times as long! For the same results! In directly optimizing the control signal, SPSA gets a big win over standard FDSA. So, if you’re looking to directly optimize over a loss function, SPSA is probably the way you want to go. First off, I thought it was really neat to directly apply gradient approximation methods to optimizing the control signal. It’s something I haven’t tried before, but definitely makes sense, and can generate some really nice results when tuned properly. Automating the tuning is definitely I’ll be discussing in future posts, because doing it by hand takes a long time and is annoying. In the LQR, the gradient approximation was best done by the FDSA. I think the main reasons for this is that in solving for the control signal the LQR algorithm uses matrix inverses, and any errors in the linear approximations to the dynamics are going to be amplified quite a bit. If I did anything less than 10-15 iterations (20 for the 3-link arm) in the SPSA approximation then things exploded. Also, here the SPSA algorithm required a matrix inverse, where the FDSA didn’t. This is because we only varied one parameter at a time in FDSA, and the effects of changing each was isolated. In the SPSA case, we had to consider the changes across all the variables and the resulting effects all at once, essentially noting which variables changed by how much and the changes in each case, and averaging. Here, even with the more complex 3-link arm, FDSA was faster, so I’m going to stick with it in my LQR and iLQR implementations. In the direct control signal optimization SPSA beat the pants off of FDSA. It was almost 5 times faster for control of the 3-link arm. This was, again, because in this case we could use noisy samples of the gradient of the loss function and relied on noise to cancel itself out as we iterated. So we only needed 2 samples of the loss function in SPSA, where in FDSA we needed 2*num_parameters. And although this generated pretty good results I would definitely be hesitant against using this for any more complicated systems, because tuning that cost function to get out a good trajectory was a pain. If you’re interested in playing around with this, you can check out the code for the gradient controllers up on my GitHub. 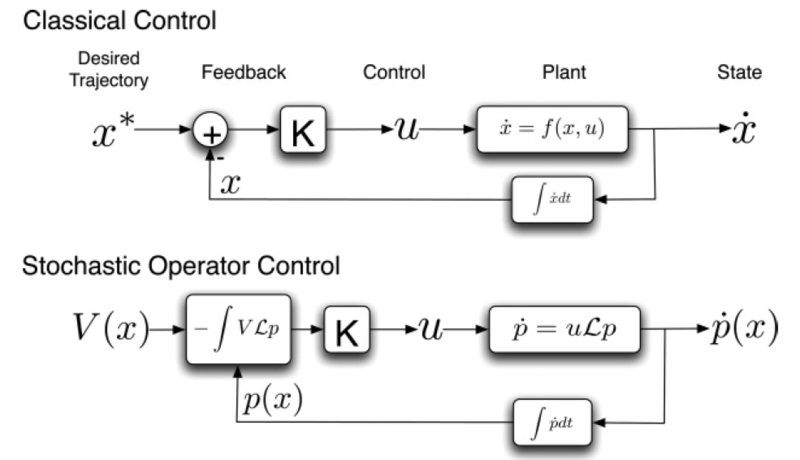 One of the standard controllers in basic control theory is the linear-quadratic regulator (LQR). There is a finite-horizon case (where you have a limited amount of time), and an infinite-horizon case (where you don’t); in this post, for simplicity, we’re only going to be dealing with the infinite-horizon case. where is the target state, and and are weights on the cost of not being at the target state and applying a control signal. The higher is, the more important it is to get to the target state asap, the higher is, the more important it is to keep the control signal small as you go to the target state. drives the system to the target. When the system is a linear system with a quadratic cost function, this can be done optimally. There is lots of discussion elsewhere about LQRs and their derivation, so I’m not going to go into that with this post. Instead, I’m going to talk about applying LQRs to non-linear systems, and using finite differences to do it, which works when you have a readily accessible simulation of the system on hand. The fun part is that by using finite differences you can get this to work without working out the dynamics equations yourself. We’ll do this by approximating the actual dynamics of the system linearly. We’ll then solve for our gain value , generate our control signal for this timestep, and then re-approximate the dynamics again at the next time step and solve for from the new state. The more non-linear the system dynamics are, the less appropriate will be for generating our control signal as we move away from the state was calculated in; this is why update time of the LQR can become an important factor. If you’re going to try this for the 3-link arm, though, get out Mathematica. Do not try this by hand. If you disregard my warning and foolhardily attempt such a derivation you will regret, repent, and then appeal to Wolfram Alpha for salvation. These equations quickly become terrible and long even for seemingly not-so-complicated systems. and you can see the actual rate of change of at plotted in the blue dashed line, and the approximated rate of change calculated using finite differences plotted in the red dashed line. We can also see that the approximated derivative is only accurate near (the blue dot). Now we’re able to generate our and matrices we have everything we need to solve for our feedback gain matrix ! Which is great. If you are calculating your feedback gain matrix using the continuous solution to the algebraic Riccati equation, then you need to be returning . If you’re solving for using the discrete solution to the algebraic Riccati equation you need to return . This was just something that I came across as I was coding and so I wanted to mention it here in case anyone else stumbled across it! Alright! Let’s have a look at how the LQR does controlling non-linear systems. Below we have the control of a 2-link arm compared to a 3-link arm, and you can see the control of the 2-link arm is better. This is a direct result of the dynamics of a 3-link arm being significantly more complex. So, there are some obvious points where sampling the dynamics at a .01 time step is noticeably less accurate, but all in all there’s not a huuuggge difference between sampling at .01 and .0001 seconds. If you’re just watching the end-effector path it’s really not very noticeable. You can see how the elements of and are changing fairly slowly; this means that is going to be an effective feedback gain for a fair chunk of time. And the computational savings you get by sampling the dynamics and regenerating every .01 seconds instead of every .0001 seconds are pretty big. This was just another thing that I came across when playing around with the LQR, the take away being don’t just assume you need to update your system crazy often. You might get very comparable performance for much less computational cost. All in all, the LQR controller is pretty neat! It’s really simple to set up, and generic. We don’t need any specific information about the system dynamics, like we do for effective operational space control (OSC). When we estimate the dynamics with finite differences, all need is a decent system model that we can sample. Again, the more non-linear the system, of course, the less effective a LQR will be. If you’re interested in playing around with one, or generating the figures that I show above, the code is all up and running on my Github for you to explore. ABR Jaco2 repo public release! ABR Control repo public release! Traditionally, deep learning is applied to feed-forward tasks, like classification, where the output of the network doesn’t affect the input to the network. It is a decidedly harder problem when the output is recurrently connected such that network output affects the input. Because of this application of deep learning methods to control was largely unexplored until a few years ago. Recently, however, there’s been a lot of progress and research in this area. In this post I’m going to talk about an implementation of deep learning for control presented by Dr. Ilya Sutskever in his thesis Training Recurrent Neural Networks. In his thesis, Dr. Sutskever uses augmented Hessian-free (AHF) optimization for learning. There are a bunch of papers and posts that go into details about AHF, here’s a good one by Andrew Gibiansky up on his blog, that I recommend you check out. I’m not going to really talk much here about what AHF is specifically, or how it differs from other methods, if you’re unfamiliar there are lots of places you can read up on it. Quickly, though, AHF is kind of a bag of tricks you can use with a fast method for estimating the curvature of the loss function with respect to the weights of a neural network, as well as the gradient, which allows it to make larger updates in directions where the loss function doesn’t change quickly. So rather than estimating the gradient and then doing a small update along each dimension, you can make the size of your update large in directions that change slowly and small along dimensions where things change quickly. And now that’s enough about that. In this post I’m going to walk through using a Hessian-free optimization library (version 0.3.8) written by my compadre Dr. Daniel Rasmussen to train up a neural network to train up a 2-link arm, and talk about the various hellish gauntlets you need run to get something that works. Whooo! The first thing to do is install this Hessian-free library, linked above. I’ll be working through code edited a bit for readability, to find the code in full you can check out the files up on my GitHub. The output layer connects in to the plant, and, for those unfamiliar with control theory terminology, ‘plant’ just means the system that you’re controlling. In this case an arm simulation. where is the total cost of the trajectory generated with , the set of network parameters, is the immediate state cost, is the final state cost, is the state of the arm, is the target state of the arm, is the control signal (torques) that drives the arm, and is a gain value. Note that if you want to run it on your GPU you’ll need PyCuda and sklearn installed. And a GPU. And you can see in the last couple lines that to implement the distance to target as a final state cost penalty only we just set all of the targets before the final time step equal to np.nan. If we wanted to penalize distance to target throughout the whole trajectory we would just comment that line out. Simulate the plant forward; i.e. pass in input and get back the resulting plant state at the next timestep. Calculate the derivative of the plant state with respect to the input; i.e. how do small changes in the input affect the state. Calculate the derivative of the plant state with respect to the previous state; i.e. how do small changes in the plant state affect the state at the next timestep. Calculate the derivative of the plant output with respect to its state; i.e. how do small changes in the current position of the state affect the output of the plant. So 1 is easy, we have the arm simulations that we want already, they’re up on my GitHub. Number 4 is actually trivial too, because the output of our plant is going to be the state itself, so the derivative of the output with respect to the state is just the identity matrix. For 2 and 3, we’re going to need to calculate some derivatives. If you’ve read the last few posts you’ll note that I’m on a finite differences kick. So let’s get that going! Because no one wants to calculate derivatives! Important note, the notation in these next couple pieces of code is going to be a bit different from my normal notation because they’re matching with the hessianfree library notation, which is coming from a reinforcement learning literature background instead of a control theory background. So, s is the state of the plant, and x is the input to the plant. I know, I know. All the same, make sure to keep that in mind. Alrighty. First we create a tensor to store the results. Why is it a tensor? Because we’re going to be doing a bunch of runs at once. So our state dimensions are actually trials x size_input. When we then take the partial derivative, we end up with trials many size_input x size_state matrices. Then we increase each of the parameters of the input slightly one at a time and store the results, decrease them all one at a time and store the results, and compute our approximation of the gradient. Next we’ll do the same for calculating the derivative of the state with respect to the previous state. This is definitely not the fastest code to run. Much more ideally we would put the state and input into vectors and do a single set of computations for each call to activation rather than having that for loop in there. Unfortunately, though, we’re not assuming that we have access to the dynamics equations / will be able to pass in vector states and inputs. Looking at the above code that seems pretty clear what’s going on, except you might notice that last line calling self.squashing. What’s going on there? This ends up being a pretty important piece of the code here. Basically it prevents wild changes to the weights during learning to result in the system breaking down. So the state of the plant can’t go off to infinity and cause an error to be thrown, stopping our simulation. But because the target state is well within the bounds of where the squashing function does nothing, post-training we’ll still be able to use the resulting network to control a system that doesn’t have this fail safe built in. Think of this function as training wheels that catch you only if you start falling. With that, we no have pretty much all of the parts necessary to begin training our network! A quick aside: if you want to run this code yourself, get a real good computer, have an arm simulation ready, the hessianfree Python library installed, and download and run this train_hf.py file. (Note: I used version 0.3.8 of the hessianfree library, which you can install using pip install hessianfree==0.3.8) This will start training and save the weights into a weights/ folder, so make sure that that exists in the same folder as train_hf.py. If you want to view the results of the training at any point run the plot_error.py file, which will load in the most recent version of the weights and plot the error so far. If you want to generate an animated plot like I have below run gen_animation_plots.py and then the last command from my post on generating animated gifs. where you replace arm2_python with whatever arm model you trained your model on. Note the --dt=1e-2 flag, that is important because the model was trained with a .01 timestep and things get a bit weird if you suddenly change the dynamics on the controller. OK let’s look at some results! OK full discretion, these results are not optimizing the cost function we discussed above. They’re implementing a simpler cost function that only looks at the final state, i.e. it doesn’t penalize the magnitude of the control signal. I did this because Dr. Sutskever says in his thesis he was able to optimize with just the final state cost using much smaller networks. I originally looked at neurons with 96 neurons in each layer, and it just took forgoddamnedever to run. So after running for 4 weeks (not joking) and needing to make some more changes I dropped the number of neurons and simplified the task. The results below are from running a network with 32 neurons in each layer controlling this 2-link arm, and took another 4-5 weeks to train up. Hey that looks good! Not bad, augmented Hessian-free learning, not bad. It had pretty consistent (if slow) decline in the error rate, with a few crazy bumps from which it quickly recovered. Also take note that each training iteration is actually 32 runs, so it’s not 12,50-ish runs it’s closer to 400,000 training runs that it took to get here. What I found frustrating about this was that if you look at the error over time then this arm is doing as well or better than the previous arm at a lot of points. But the corresponding trajectories look terrible, like something you would see in a horror movie based around getting good machine learning results. This of course comes down to how I specified the cost function, and when I looked at the trajectories plotted over time the velocity of the arm is right at zero at the final time step, which it is not quiiiitte the case for the first controller. So this second network has found a workaround to minimize the cost function I specified in a way I did not intend. To prevent this, doing something like weighting the distance to target heavier than non-zero velocity would probably work. Or possibly just rerunning the training with a different random starting point you could get out a better controller, I don’t have a great feel for how important the random initialization is, but I’m hoping that it’s not all too important and its effects go to zero with enough training. Also, it should be noted I’ve run the first network for 12,500 iterations and the second for less than 6,000, so I’ll keep letting them run and maybe it will come around. The first one looked pretty messy too until about 4,000 iterations in. This is what I’ve done in the results above. And it worked well enough in that case. (i.e. to include a penalty for distance to target throughout the trajectory and not just at the final time step) which resulted in straighter trajectories when controlling the 2-link arm. So I thought I would try this here as well. Sadly (incredibly sadly), this was fairly fruitless. The network didn’t really learn or improve much at all. This method gave much better results. BUT WHY? I hear you ask! Good question. Let me give giving explanation a go. Essentially, it’s because the cost function is more complex now. In the first training method, the output from the plant is fed back into the network as input at every time step. When the cost function was simpler this was OK, but now we’re getting very different input to train on at every iteration. So the system is being pulled in different directions back and forth at every iteration. In the second training regime, the same input is given several times in a row, which let’s the system follow the same gradient for a few training iterations before things change again. In my head I picture this as giving the algorithm a couple seconds to catch its breath dunking it back underwater. This is a method that’s been used in a bunch of places recently. One of the more high-profile instances is in the results published from DeepMind on deep RL for control and for playing Go. And indeed, it also works well here. So you can see that we do one rollout with the weights, then go in and get the inputs and targets that were used in that rollout, and start training the network while holding those constant for batch_size epochs (training sessions). From a little bit of messing around I’ve found batch_size=32 to be a pretty good number. So then it runs 32 training iterations where it’s updating the weights, and then saves those weights (because we want a loooottttt of check-points) and then restarts the loop. Embarrassingly, I’ve lost my simulation results from this trial, somehow…so I don’t have any nice plots to back up the above, unfortunately. But since this is just a blog post I figured I would at least talk about it a little bit, since people might still find it useful if they’re just getting into the field like me. and just update this post whenever I re-run them. If I rerun them. What I do have, however, are results where this method doesn’t work! I tried this with the simpler cost function, that only looks at the final state distance from the target, and it did not go so well. Let’s look at that one! My guess here is basically that the system has gotten to a point where it’s narrowed things down in the parameter space and now when you run 32 batches it’s overshooting. It needs feedback about its updates after every update at this point. That’s my guess, at least. So it could be the case that for more complex cost functions you’d want to train it while holding the input constant for a while, and then when the error starts to plateau switch to updating the input after every parameter update. All in all, AHF for training neural networks in control is pretty awesome. There are of course still some major hold-backs, mostly related to how long it takes to train up a network, and having to guess at effective training regimes and network structures etc. But! It was able to train up a relatively small neural network to move an arm model from a center point to 64 targets around a circle, with no knowledge of the system under control at all. In Dr. Sutskever’s thesis he goes on to use the same set up under more complicated circumstances, such as when there’s a feedback delay, or a delay on the outgoing control signal, and unexpected noise etc, so it is able to learn under a number of different, fairly complex situations. Which is pretty slick. Related to the insane training time required, I very easily could be missing some basic thing that would help speed things up. If you, reader, get ambitious and run the code on your own machine and find out useful methods for speeding up the training please let me know! Personally, my plan is to next investigate guided policy search, which seems like it’s found a way around this crazy training time. A few months ago I posted on Linear Quadratic Regulators (LQRs) for control of non-linear systems using finite-differences. The gist of it was at every time step linearize the dynamics, quadratize (it could be a word) the cost function around the current point in state space and compute your feedback gain off of that, as though the dynamics were both linear and consistent (i.e. didn’t change in different states). And that was pretty cool because you didn’t need all the equations of motion and inertia matrices etc to generate a control signal. You could just use the simulation you had, sample it a bunch to estimate the dynamics and value function, and go off of that. The LQR, however, operates with maverick disregard for changes in the future. Careless of the consequences, it optimizes assuming the linear dynamics approximated at the current time step hold for all time. It would be really great to have an algorithm that was able to plan out and optimize a sequence, mindful of the changing dynamics of the system. Initialize with initial state and initial control sequence . Do a forward pass, i.e. simulate the system using to get the trajectory through state space, , that results from applying the control sequence starting in . Do a backward pass, estimate the value function and dynamics for each in the state-space and control signal trajectories. Calculate an updated control signal and evaluate cost of trajectory resulting from . If then we've converged and exit. If , then set , and change the update size to be more aggressive. Go back to step 2. If change the update size to be more modest. Go back to step 3. There are a bunch of descriptions of iLQR, and it also goes by names like ‘the sequential linear quadratic algorithm’. The paper that I’m going to be working off of is by Yuval Tassa out of Emo Todorov’s lab, called Control-limited differential dynamic programming. And the Python implementation of this can be found up on my github in my Control repo. Also, a big thank you to Dr. Emo Todorov who provided Matlab code for the iLQG algorithm, which was super helpful. where is the input control signal. The trajectory is the sequence of states that result from applying the control sequence starting in the initial state . Now we need to define all of our cost related equations, so we know exactly what we’re dealing with. where the above equation just says that the optimal cost-to-go is found by using the control sequence that minimizes . NOTE: In the paper, they use the notation to denote the value function at the next time step, which is redundant since , but it comes in handy later when they drop the dependencies to simplify notation. So, heads up: . The forward rollout consists of two parts. The first part is to simulating things to generate the from which we can calculate the overall cost of the trajectory, and find out the path that the arm will take. To improve things though we’ll need a lot of information about the partial derivatives of the system, calculating these is the second part of the forward rollout phase. To calculate all these partial derivatives we’ll use . For each we’ll calculate the derivatives of with respect to and , which will give us what we need for our linear approximation of the system dynamics. To get the information we need about the value function, we’ll need the first and second derivatives of and with respect to and . So all in all, we need to calculate , , , , , , , where the subscripts denote a partial derivative, so is the partial derivative of with respect to , is the second derivative of with respect to , etc. And to calculate all of these partial derivatives, we’re going to use finite differences! Just like in the LQR with finite differences post. Long story short, load up the simulation for every time step, slightly vary one of the parameters, and measure the resulting change. Once we have all of these, we’re ready to move on to the backward pass. Remember that , which is the value function at the next time step. NOTE: All of the second derivatives of are zero in the systems we’re controlling here, so when we calculate the second derivatives we don’t need to worry about doing any tensor math, yay! So now we have all of the terms that we need, and they’re defined in terms of the values at the next time step. We know the value of the value function at the final time step , and so we’ll simply plug this value in and work backwards in time recursively computing the partial derivatives of and . Of course, another option we need to account for is when costnew > cost. What do we do in this case? Our control update hasn’t worked, do we just exit? 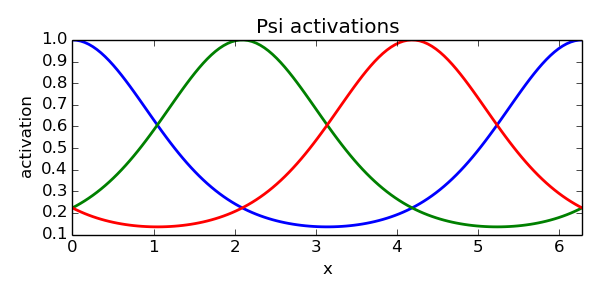 The control signal update in iLQR is calculated in such a way that it can behave like Gauss-Newton optimization (which uses second-order derivative information) or like gradient descent (which only uses first-order derivative information). The is that if the updates are going well, then lets include curvature information in our update to help optimize things faster. If the updates aren’t going well let’s dial back towards gradient descent, stick to first-order derivative information and use smaller steps. This wizardry is known as the Levenberg-Marquardt heuristic. So how does it work? Now, what happens when we change lamb? The eigenvalues represent the magnitude of each of the eigenvectors, and by taking their reciprocal we flip the contributions of the vectors. So the ones that were contributing the least now have the largest singular values, and the ones that contributed the most now have the smallest eigenvalues. By adding a regularization term we ensure that the inverted eigenvalues can never be larger than 1/lamb. So essentially we throw out information. In the case where we’ve got a really good approximation of the system dynamics and value function, we don’t want to do this. We want to use all of the information available because it’s accurate, so make lamb small and get a more accurate inverse. In the case where we have a bad approximation of the dynamics we want to be more conservative, which means not having those large singular values. Smaller singular values give a smaller estimate, which then gives smaller gain matrices and control signal update, which is what we want to do when our control signal updates are going poorly. And that is pretty much everything! OK let’s see how this runs! or substitute in arm3. If you’re having trouble getting the arm2 simulation to run, try arm2_python, which is a straight Python implementation of the arm dynamics, and should work no sweat for Windows and Mac. Something that you may notice is that the control of the 3 link is actually straighter than the 2 link. I thought that this might be just an issue with the gain values, since the scale of movement is smaller for the 2 link arm than the 3 link there might have been less of a penalty for not moving in a straight line, BUT this was wrong. You can crank the gains and still get the same movement. The actual reason is that this is what the cost function specifies, if you look in the code, only penalizes the distance from the target, and the cost function during movement is strictly to minimize the control signal, i.e. .
where all I had to do was include the position penalty term from the final state cost into the immediate state cost. In these simulations the system is simulating at .01 time step, and I gave it 100 time steps to reach the target. What if I give it only 50 time steps? It looks pretty much the same! It’s just now twice as fast, which is of course achieved by using larger control signals, which we don’t see, but dang awesome. What if we try to make it there in 10 time steps?? OK well that does not look good. So what’s going on in this case? Basically we’ve given the algorithm an impossible task. It can’t make it to the target location in 10 time steps. In the implementation I wrote here, if it hits the end of it’s control sequence and it hasn’t reached the target yet, the control sequence starts over back at t=0. Remember that part of the target state is also velocity, so basically it moves for 10 time steps to try to minimize distance, and then slows down to minimize final state cost in the velocity term. This algorithm has been used in a ton of things, for controlling robots and simulations, and is an important part of guided policy search, which has been used to very successfully train deep networks in control problems. It’s getting really impressive results for controlling the arm models that I’ve built here, and using finite differences should easily generalize to other systems. iLQR is very computationally expensive, though, so that’s definitely a downside. It’s definitely less expensive if you have the equations of your system, or at least a decent approximation of them, and you don’t need to use finite differences. But you pay for the efficiency with a loss in generality. There are also a bunch of parameters to play around with that I haven’t explored at all here, like the weights in the cost function penalizing the magnitude of the cost function and the final state position error. I showed a basic example of changing the cost function, which hopefully gets across just how easy changing these things out can be when you’re using finite differences, and there’s a lot to play around with there too. where was the backtracking search parameter, which gets set to one initially and then reduced. It’s very possible I didn’t implement it as intended, but I found consistently that always generated the best results, so it was just adding computation time. So I left it out of my implementation. If anyone has insights on an implementation that improves results, please let me know! And then finally, another thank you to Dr. Emo Todorov for providing Matlab code for the iLQG algorithm, which was very helpful, especially for getting the Levenberg-Marquardt heuristic implemented properly. So far we’ve looked at using DMPs for discrete movements, but as I briefly mentioned it’s also possible to use them to perform rhythmic movements. In this post we’re going to look at the implementation of rhythmic DMPs and see exactly how it’s done. It’s actually pretty straightforward, which is always nich. We’ll go through everything that has to change and then see a couple of different applications of rhythmic DMPs. Again, all the code for the DMPs and arm control implementations can be found up on my Github. We’ll start with the canonical system. In the discrete case our canonical system (which drives the activation of the basis functions) decayed from to and then we were all done. In the rhythmic case we want our system to repeat indefinitely, so we need a reliable way of continuously activating the basis functions in the same order. One function that may come to mind that reliably repeats is the cosine function. But how to use the cosine function, exactly? The placement of the center points of the rhythmic system is a lot easier than in the discrete case because the rhythmic canonical system dynamics are linear. In the actual implementation of the rhythmic system there are a couple of other differences that you need to be aware of. The first is that there is no diminishing term in the rhythmic system, whereas there is in the discrete case. The second is how to go about establishing goal states when imitating an path. We’re going to assume that whatever path is passed in to us is going to be a rhythmic pattern, and then goal state is going to be set as the center point of the desired trajectory. So for rhythmic systems the ‘goal’ is actually more like a center point for the trajectory. And that’s pretty much it! If you look through the code that I have up for the rhythmic DMP subclass you’ll see that only a handful of functions needed to be redefined, the rest is the same! Well that’s great, let’s look at some applications. I was thinking of different examples that would be interesting to see of the rhythmic DMPs, and after a little consideration the most obvious application of rhythmic DMPs is really to a system that does something like walking. In the spinal cord of animals there are circuits which are known as central pattern generators (CPGs), and when stimulated these have been shown to generate rhythmic, repeated movements (as described in Principles of rhythmic motor pattern generation and other papers). Let’s go ahead and build our own CPG here using DMPs. I don’t have a simulation of a set of legs, however, so instead we’ll look at getting a single 3-link arm to reproduce a pattern of behaviour that you’d expect in a leg that is walking. Which is some very useful information! I just need to transfer this into a Numpy vector that I can feed into the system and convert degrees to radians and we should be good to go! To get the information out of the graph, use your favorite data stripper, I used http://arohatgi.info/WebPlotDigitizer/app/. And there you go! It’s neat how straightforward that was, once you have the data of the system you want to model. It shows the power of DMPs for coordinating multiple degrees of freedom quickly and easily. Also something that’s worth pointing out once again is that this is a force based controller. We were able to go from a kinematic description of the movement we wanted to a reliable system generating torques. It’s another good example of the dexterity of dynamic movement primitives. If you have any questions or trouble running the code please contact me. The third (and final, at the moment) paper in the likelihood calculus series from Dr. Terrence Sanger is Distributed control of uncertain systems using superpositions of linear operators. Carrying the torch for the series right along, here Dr. Sanger continues investigating the development of an effective, general method of controlling systems operating under uncertainty. This is the paper that delivers on all the promises of building a controller out of a system described by the stochastic differential operators we’ve been learning about in the previous papers. In addition to describing the theory, there are examples of system simulation with code provided! Which is a wonderful, and sadly uncommon, thing in academic papers, so I’m excited. We’ll go through a comparison of Bayes’ rule and Markov processes (described by our stochastic differential equations), go quickly over the stochastic differential operator description, and then dive into the control of systems. The examples and code run-through I’m going to have to save for another post, though, just to keep the size of this post reasonable. where represents the environment dynamics, previously also referred to as the unforced or passive dynamics of the system, describes how the control signal affects the system state , describes the state and control dependent additive noise, and is a set of independent noise processes such as Brownian motion. Our control goal is to find a set of functions of time, , such that the dynamics of our system behave according to a desired set of dynamics that we have specified. In prevalent methods in control theory, uncertainty is a difficult problem, and often can only be effectively handled with a number of simplifications, such as linear systems of Gaussian added noise. In biological systems that we want to model, however, uncertainty is ubiquitous. There is noise on outgoing and incoming signals, there are unobserved controllers simultaneously exerting influence over the body, complicated and often unmodeled highly non-linear dynamics of the system and its interactions with the environment, etc. In the brain especially, the effect of unobserved controllers is a particular problem. Multiple areas of the brain will simultaneously be sending out control signals to the body, and the results of these signals tends to be only partially known or known only after a delay to the other areas. So for modeling, we need an effective means of controlling distributed systems operating under uncertainty. And that’s exactly what this paper presents: ‘a mathematical framework that allows modeling of the effect of actions deep within a system on the stochastic behaviour of the global system.’ Importantly, the stochastic differential operators that Dr. Sanger uses to do this are linear operators, which opens up a whole world of linear methods to us. Bayesian estimation is often used in sensory processing to model the effects of state uncertainty, combining prior knowledge of state with a measurement update. Because we’re dealing with modeling various types of system uncertainty, it seems like a good idea to consider Bayes’ rule. Here, Dr. Sanger shows that Bayes’ rule is in fact insufficient in this application, and Markov processes must be used. There are a number of neat insights that come from this comparison, so it’s worth going through. where and are the prior and posterior distributions, respectively, and in a diagonal matrix with elements . So where in Bayes’ rule the matrix (our linear operator) maps the prior distribution into the posterior distribution, in Markov processes the linear operator maps the probability density of the state at time into the density at time . The differences come in through the form of the linear operators. The major difference being that is a diagonal matrix, while there is no such restriction for . The implication of this is that in Bayes’ rule the update of a given state depends only on the prior likelihood of being in that state, whereas in Markov processes the likelihood of a given state at time can depend on the probability of being in other states at time . The off diagonal elements of allow us to represent the probability of state transition, which is critical for capturing the behavior of dynamical systems. This is the reason why Bayes’ method is insufficient for our current application. is referred to as our stochastic differential operator. Because the Fokker-Planck equation is proven to preserve probability densities (non-negativity and sum to 1), applying to update our density will maintain its validity. What is so exciting about these operators is that even though they describe nonlinear systems, they themselves are linear operators. What this means is that if we have two independent components of a system that affect it’s dynamics, described by and , we can determine their combined effects on the overall system dynamics through a simple summation, i.e. .
It’s worth noting also here that the resulting still preserves the validity of densities that it is applied to. How well can the system approximate a set of desired dynamics? In this next section of the paper, Dr. Sanger talks about reworking the stochastic operators of a system into an orthogonal set, which can then be used to easily approximate a desired set of dynamics. It’s my guess that the motivation behind doing this is to see how close the given system is able to come to reproducing the desired dynamics. This is my guess because this exercise doesn’t really generate control information that can be used to directly control the system, unless we translate the weights calculated by doing this back into term of the actual set of actions that we have available. But it can help you to understand what your system is capable of. in the continuous-state space. So this inner product calculates the change in probability density resulting from applying these two operators to this initial condition, and finds the amount which they move the system in the same direction as the measure of similarity. 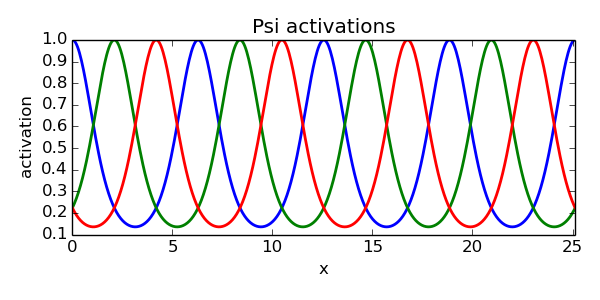 This could then be used as a comparison measure as the best approximation to a desired set of dynamics that a given system can achieve with its set of operators. where describes the unforced/passive dynamics of the system, describes the control-dependent dynamics, and is our control signal. which can be read as the cost of each state weighted by the current likelihood of being in that state. which is intuitively read: The effect that the control signal has on the instantaneous change in expected value over time is equal to the change in probability of each state weighted by the cost of that state. To reduce , all we need to know now is the sign of the right-hand side of this equation, which tells us if we should increase or decrease . Neat! Although we only need to know the sign, it’s nice to include slope information that gives some idea of how far away the minimum might be. At this point, we can simply calculate our control signal in a gradient descent fashion, by setting . The standard gradient descent interpretation of this is that we’re calculating the effect that has on our function , and assuming that for some small range, , our function is approximately linear. So we can follow the negative of the function’s slope at that point to find a new point on that function that evaluates to a smaller value. Dr. Sanger notes that, as mentioned before, neural systems will often not permit negative control signals, so where we set . The value of for a given controller is proportional to the ability of that controller to be reduce the expected cost at that point in time. If all of the , then it is not possible for the available controllers to reduce the expected cost of the system. The most obvious differences are that a cost function has replaced the desired trajectory and the state has been replaced by a probability density over the possible states, . Additionally, the feedback in classical control is used to find the difference between the desired and actual state, which is then multiplied by a gain, to generate a corrective signal, i.e. , whereas in stochastic operator control signal is calculated as specified above, by following the gradient of the expected value of the cost function, i.e. . Right away there is a crazy difference between our two control systems already. In classical control case, we’re following a desired trajectory, several things are implied. First, we’ve somehow come up with a desired trajectory. Second, we’re necessarily assuming that regardless of what is actually going on in the system, this is the trajectory that we want to follow. This means that the system is not robust to changes in the dynamics, such as outside forces or perturbations applied during movement. In the stochastic operator control case, we’re not following a desired path, instead the system is looking to minimize the cost function at every point in time. This means that it doesn’t matter where we start from or where we’re going, the stochastic operator controller looks at the effect that each controller will have on the expected value of the cost function and generates a control signal accordingly. If the system is thrown off course to the target, it will recover by itself, making it far more robust than classical control theory. Additionally, we can easily change the cost function input to the system and see a change in the behaviour of the system, whereas in classical control a change in the cost function requires that we regenerate our desired trajectory before our controller will act appropriately. While these are impressive points, it should also be pointed out that stochastic operator controllers are not the first to attack these issues. The robustness and behaviour business is similarly handled very well, for specific system (either linear or affine, meaning linear in terms of the dynamics of the control signal applied) and cost function forms (usually quadratic), by optimal feedback controllers. Optimal feedback controllers regenerate the desired trajectory online, based on system feedback. This leads to a far more robust control system that classical control provides. However, as mentioned, this is only for specific system and cost function forms. In the stochastic operator control any type of cost function be applied, and the controller dynamics described by can be linear or nonlinear. This is a very important difference, making stochastic operator control far more powerful. Additionally, stochastic operator controllers operate under uncertainty, by employing a probability density to generate a control signal. All in all, stochastic operator controllers provide an impressive and novel amount of flexibility in control. Here, Dr. Sanger has taken stochastic differential operators, looked at their relation to Bayes’ rule, and developed a method for controlling uncertain systems robustly. This is done through the observation that these operators have linear properties that lets the effects of distributed controllers on a stochastic system be described through a simple superposition of terms. By introducing a cost function, the effect of each controller on the expected cost of the system at each point in time can be calculated, which can then be used to generate a control signal that robustly minimizes the cost of the system through time. Stochastic differential operators can often be inferred from the problem description; their generation is something that I’ll examine more closely in the next post going through examples. Using these operators time-varying expected costs associated with state-dependent cost functions can be calculated. Stochastic operator controllers introduce a significant amount more freedom in choice of cost function than has previously been available in control. Dr. Sanger notes that an important area for future research will be in the development of methods for optimal control of systems described by stochastic differential operators. The downside of the stochastic operator controllers is that they are very computationally intensive, due to the fact that they must propagate a joint-density function forward in time at each timestep, rather than a single system state. One of the areas Dr. Sanger notes of particular importance for future work is the development of parallel algorithms, both for increasing simulation speed and examining possible neural implementations of such an algorithms. And finally, stochastic differential operators exact a paradigm shift from classical control on the way control is considered. Instead of driving the system to a certain target state, the goal is to have the system behave according to a desired set of dynamics. The effect of a controller is then the difference between the behavior of the system with and without the activity of the controller. This paper was particularly exciting because it discussed the calculation of the control signals for systems which we’ve described through the stochastic differential operators that have been developed through the last several papers. I admit confusion regarding the aside about developing an orthogonal equivalent set of operators, it seemed a bit of a red herring in the middle of the paper. I left out the example and code discussion from this post because it’s already very long, but I’m looking forward to working through them. Also worth pointing out is that I’ve been playing fast and loose moving back and forth between continuous and discrete, just in the interest in simplifying for understanding, but Dr. Sanger explicitly handles each case. I’m excited to explore the potential applications and implementations of this technique in neural systems, especially in models of areas of the brain that perform a ‘look-ahead’ type function. The example that comes to mind is that of the rat reaching an intersection in a T-maze, and the neural activity recorded from place cells in the hippocampus shows the rat simulating the result of going left of going right. This seems a particularly apt application of these stochastic differential operators, as a sequence of actions and the resulting state can then be simulated and evaluated, providing that you have an accurate representation of the system dynamics in your stochastic operators. To that end, I’m also very interested by possible means of learning stochastic differential operators for an action set. Internal models are an integral parts of motor control system models, and this seems like a potentially plausible analogue. Additionally, for modeling biological systems, the complexity of dynamics is something that is often infeasible to determine analytically. All in all, I think this is a really exciting road for exploring the neural control of movement, and I’m looking forward to seeing where it leads.